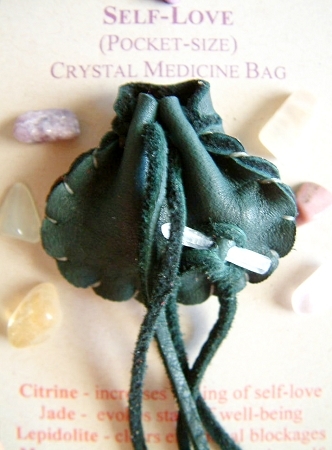 The "Self-Love" Crystal Medicine Bag (CMB) contains a collection of beautiful and powerful gemstones specifically selected to help you be gentle with yourself. It helps you to go deep within to finally love and forgive yourself. It has a wonderful soothing and loving energy. 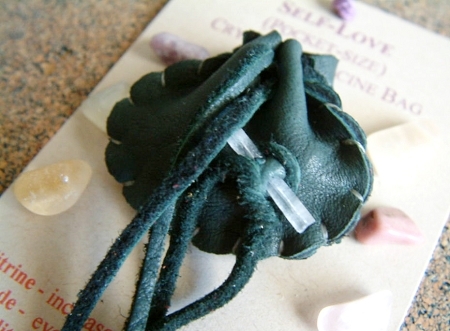 Our beautiful butter-soft deer leather pouches were handmade by a lovely couple in a spiritual home and they each have a clear quartz crystal in front to amplify the healing power of the gemstones inside the pouch. One of the unique attributes of the CMBs is that they are very small (1 1/2" x 1 3/4") and light. You can tuck them anywhere! 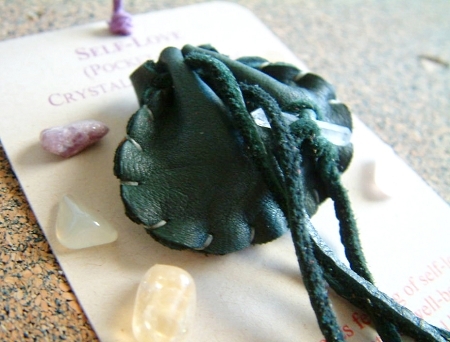 They are the ideal size to put under the pillow or in your pocket. You can use one or several together!